The Wii U's position as a party console seems to be cementing itself lately. It's now well known that the Wii U version of Super Smash Bros. can support 8-player offline play, but Toronto-based indie studio 13AM has been working on Runbow, a game that can cram a full nine people around the TV (well, one can probably sit to the side with the GamePad). 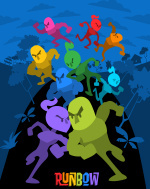 Runbow initially came to existence as an 8-player title out of the Global Game Jam. It's a multiplayer runner game with a twist: the background colour is constantly shifting, and any platforms or walls that match it will disappear until the next colour switch. We looked at Xbox, PlayStation, PC, all those things, and we just kind of did a tally of how many controllers we could link up. And when we got to Wii, we found out ... that if you tether a Wii Remote to a Wii controller four times, and then add in the Wii U tablet controller on top of it, you can get up to nine players. We’d never seen anything like that before. As may be expected, tuning a game for nine players can be a chaotic experience. Factors such as size and art style have been tweaked from the prototype to find the setup where players can best keep track of their characters. There's also the challenge of keeping the game fun for all and not having a few players always left in the dust. For that, McCall said they've turned to a style of power-ups that have drawn battle lines in other titles. "It’s sort of like Mario Kart, but we’ve actually gone one step further. If you’re in first place, you don’t just get useless items, you can actually get a power-up that kind of screws you over. The power-up referred to is Swap, which will randomly switch your character's position with another random character, regardless of your standing. For another cool but potentially infuriating perk, depending on your role, one mode will allow the GamePad player to control the level elements as the "ColourMaster." Runbow is currently slated for a 2015 release. You can read the full interview with the ambitious folks at 13AM on Gamasutra. 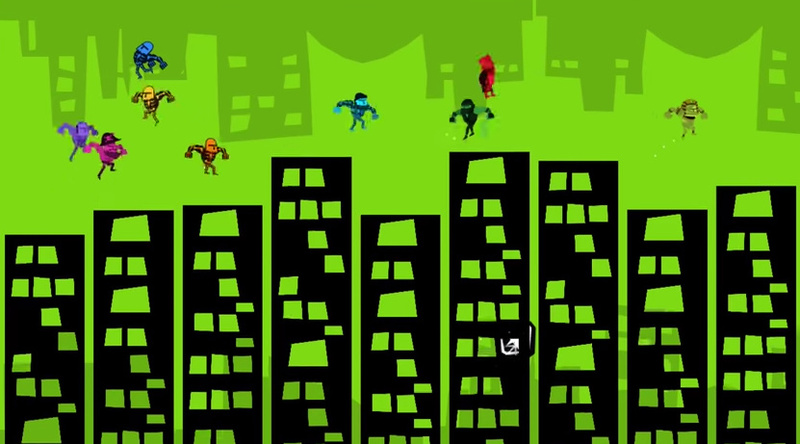 What do you think of the prospect of room-filling party games such as Runbow and Smash Bros.? Let us know in the comments below. Sounds potentially hectic and fun, though I can't say that the art style draws me. I currently have issues getting enough people interested to get 3 players in a game. Definitely no way I can do 9. Looks cool, but local multiplayer with does not work. This looks amazing! Tbh I was not excited at the prospect of yet another auto-runner, but this one seems so hectic and the colors change so much it just seems like a TON of fun! Dont really like endless running, but multiplyer makes it an entirely different experience, reminds me of the new Rayman games. This game and a keg and you could have something. They cant be serious about 4 Wiimotes and nunchucks though, not a fan of that. Nintendo needs to open up access to the Gamecube adapter. 8 player in SSBU means they'll sell a bunch, but more games using it should mean more sales of the adapter. And at $20 each they must be making a profit on those. But damn 9 player's, that's going to be crazy if i find 8 other people.So day one buy if i have enough people to play with. I'm gonna keep an eye on this just for the 9 player aspect. When will I ever have that many people playing? I'm not sure, but it sounds like it could be a blast. To share controllers isn't a new Idea. Wheelspin for Wii allows 8-Player-Split-Screen-Multiplayer with multiple controller options; or the old Micro Machines on Snes. But the overload, the "ColourMaster"-Mode ... day one! Looks fun, lets see how it shapes up. Sounds like fun, I think its great you can have so many players. I didn't think it was necessary to have each player share a wii-mote nunchuck combo. Didn't I read somewhere that the Wii U can have 10 different controllers hooked up at the same time, be it wiimote or Pro Controller? The developers said on Twittter that they will support as many controllers as they get the API for, so perhaps they will support the same set of controllers as SSB U in the end? That looks awesome! I'll look into it. In for more local multiplayer game support like this! I dig playing games with others in the same room. @ObviouslySheik Do the titles "Smash Bros." and "Mario Kart" ring a bell? Not to mention DK, TW101, Splatoon, Yoshi's Wooly World, Mario Maker... etc. @GamecubeComplex Well I have a 3DS XL and I have Mario Kart 7 and DS. Plus I have DK on my Wii. Mario Kart 8 didn't really grab my attention. I tried the Smash Bros demo and I honestly didn't like it at all. I didn't like the controls or the exaggerated music or that weird black outline that all the characters have. As for those other games you mentioned- Mario Maker looks alright, I HATE HATE HATE Yoshi games, and those others don't interest me. So yeah, I follow all the Nintendo-related news and so I know if all the games, it's just that none of them really seemed innovative or fresh enough that I'd want a Wii U. First, 8 player SSBWiiU and now this. Geez, the Brady Bunch is all set. More local multiplayer games for variety is good, as I anticipate my WiiU becoming a party machine with 8 player Smash! Color changing concept is interesting, and it seems to work well in the video, though it does look like it will get quite hectic over time! From the description I thought it was going to be an endless runner, in which case each player would probably only need 1 or 2 buttons. Per the video though it looks like each player can run and jump, which may require 3-6 buttons (4 directional and 1-2 action), so I am assuming this would require each wiimote to be connected to a Wii classic controller or to use a WiiU pro controller.